Vivid retro-style design ensures that the adorable My Best Friend & Me board books are great to look at, but it's the special added feature that really makes them stand out. Each one includes a super-cute animal finger puppet that interacts with every page! 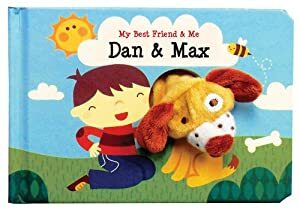 Children will want to hear the story of Dan and his loyal pup Max over and over again as the two take a trip into town, and little ones will be thrilled as the friendly plush dog come to life with the help of their own or an older reader's finger. This short board book for young children has a finger puppet inserted into the book so as the book is read the child can move the finger puppet through the story. It is a story about Dan, the boy, and his best friend , Max, the dog. They go through the town toward the bakery and meet various people along the way.. I feel your young child will enjoy the experience of moving the little finger puppet through the story as it is read.